There is still a mound of unanswered questions about the firing of now-former FBI Director James Comey, chief among them: Did Director Comey’s firing have anything to do with the bureau’s ongoing investigation into possible Russian collusion with the Trump campaign during the 2016 election? 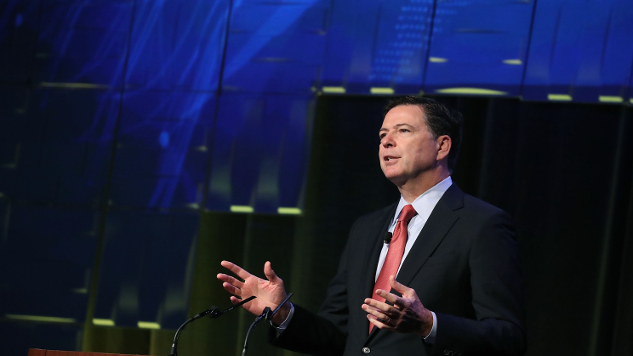 In March, former Director Comey confirmed that the FBI was looking into members of the Trump campaign while also dispelling the President’s tweets about Barack Obama “wiretapping” him. Around that same time, according to The NYT’s reporting, former Director Comey met with Deputy Attorney General Rod J. Rosenstein to request additional resources and then briefed members of Congress on the meeting with Rosenstein (who wrote the memo to justify Comey’s firing and cited the Clinton case). Currently, President Trump has only weighed in about the firing via Twitter and said that, “Comey lost the confidence of almost everyone in Washington, Republican and Democrat alike. When things calm down, they will be thanking me!” Last week, the tweeter-in-chief claimed that former Director Comey’s action gave Clinton a “free pass” even though President Trump praised Comey’s handling of the matter in October 2016. For what it’s worth, Katy Tur of NBC News, citing Sarah Isgur Flores at the Department of Justice, reports that Comey made no such request. Sarah Isgur Flores at DOJ flatly denies Comey asked for more money or more resources. Completely false, she says. I asked if she might not know, she said she spoke to Rosenstein directly about it.